Small dining spaces and tips for entertaining LARGE! In many older homes across the country the rooms are scaled down in size from what you might find in newer home designs. When entertaining guests it can be cumbersome in a tightly packed dining room built for a small family meal. Our home is just that, and although we live in a somewhat sprawling rancher of 3,400 sq ft, much of it is wasted space. We knew that going in, but we have learned to adapt and find ways to fit in guests when we have them. Small dining spaces are challenging. 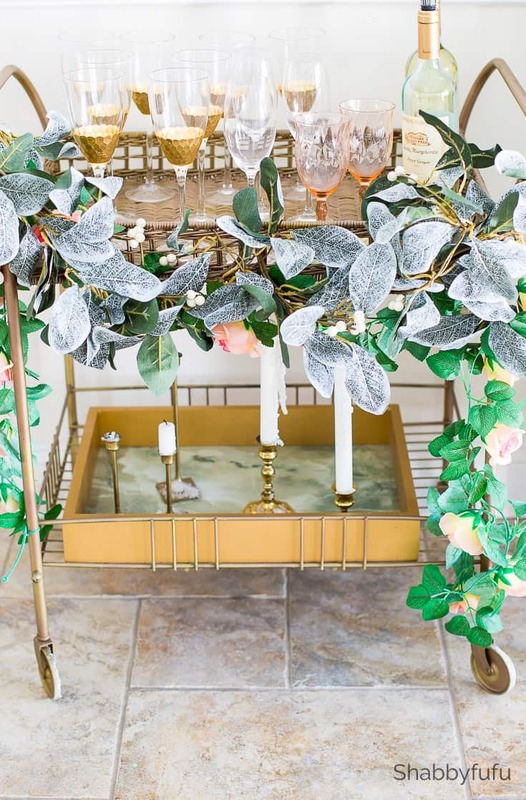 I try to be a creative hostess and work with the space available to me and change up the styling often. How do I do that? Simply by changing the accessories with perhaps some floral arrangements (real or faux), a pillow or two or some artwork. I hang very little artwork around our home because I love to move things around! Recently I received four new pieces of art from my sponsor DISPLATE and I have to say that they are such a fun and unique concept! When I had the chance to work with them I wasn’t sure, since I wasn’t too familiar with artwork printed on metal. So I investigated and what intrigued me was the fact that you don’t need to permanently mount them and they hang on the wall with magnets. 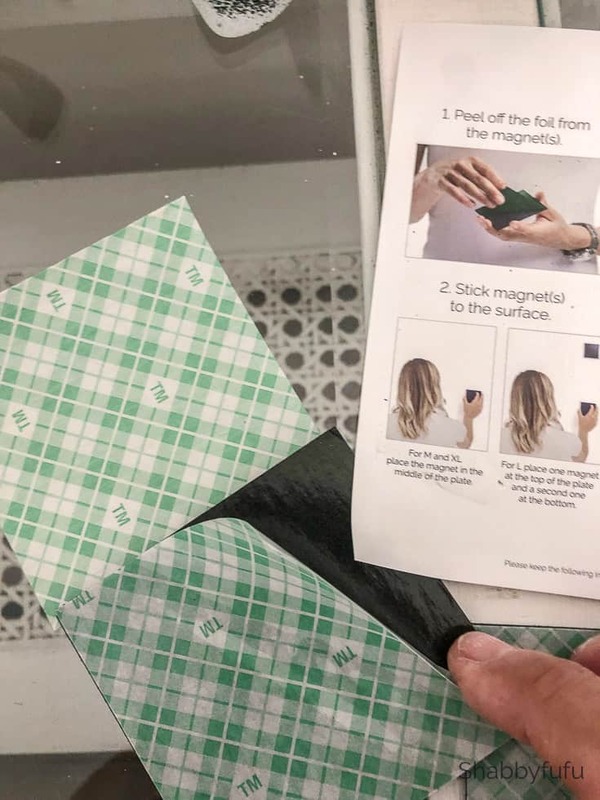 You just peel of the plastic that covers the sticky portion of the magnet on one side and press it against your wall. Then you place the Displate poster over it. It’s really simple and since I hung these quickly without measuring, I love the fact that you can slide the plate exactly where you want it once the magnet is on the wall. Hope that makes sense but it’s so intuitive and by the way…removing the magnet from the wall is easy and there was no damage. A genius concept for someone like me who plays the decorating switcheroo quite often! When I entertain large in my small spaces I spread things out. Sometimes it might be adding folding tables, as I did for my daughter’s wedding reception. We had more people than I normally might entertain, so the party was carried outdoors to our covered patio. It’s not always possible to entertain outdoors for many of you, so utilizing little nooks and crannies indoors can work well. 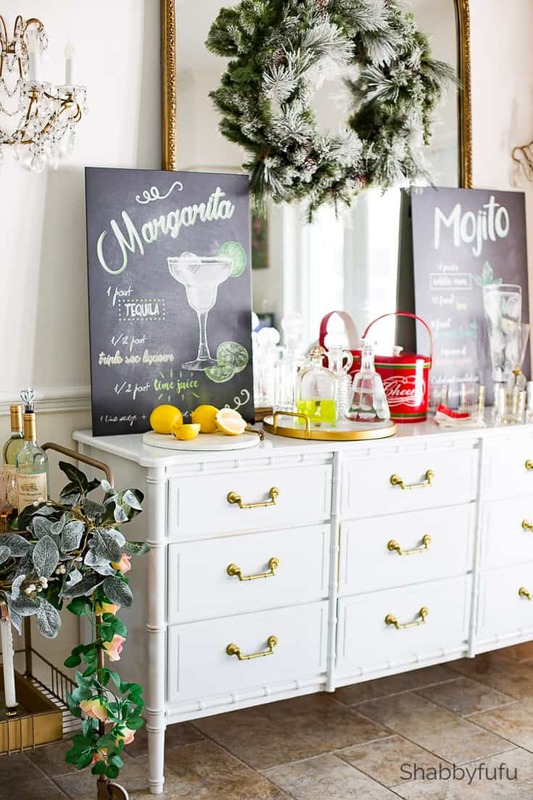 We generally have an open house cocktail party for friends and neighbors sometime during the holiday season. I like to set up casually but elegantly and all of the food is served buffet style. We remove the dining chairs from the table area and spread them around as occasional chairs. Our dining area may look large, but with our small dining space this allows freedom to walk around it and to get to the buffet. The buffet is often used for a cocktail area, so I decided to create some whimsy with two of the DISPLATE metal posters that I received. 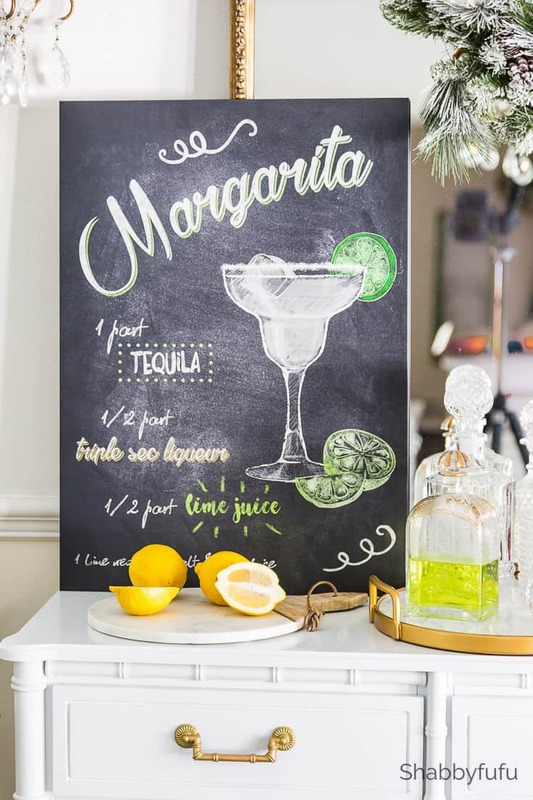 They are printed in a chalkboard style on the metal and the sturdiness allows them to sit on the buffet without any issues. Click here to find the prints that I selected DRINKS & COCKTAILS. There are lots of choices for your style and home with Displate being a portal gathering talented artists. 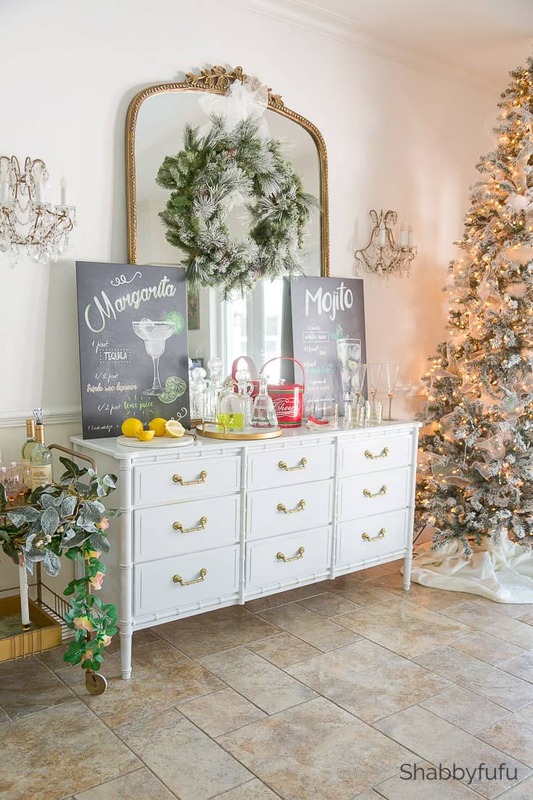 I set up a holiday themed bar cart with various extra stemware and drinks. 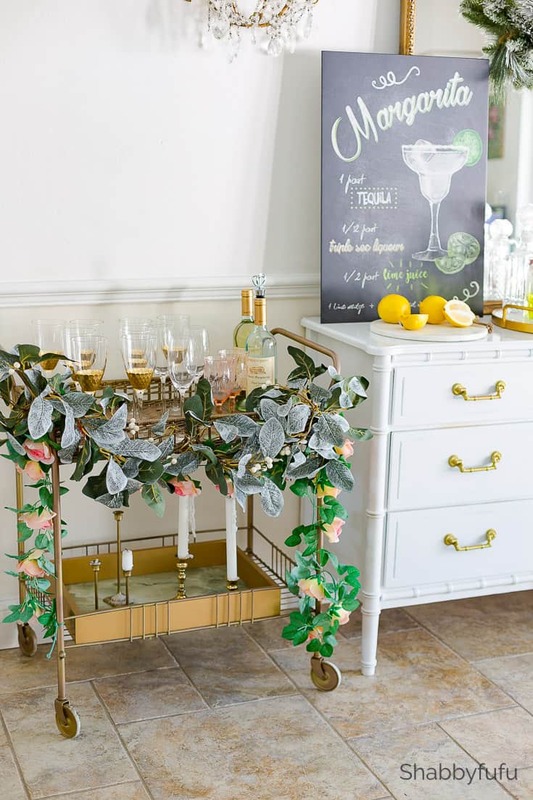 Bar carts are generally on wheels, so it really helps as a flexible element in entertaining. 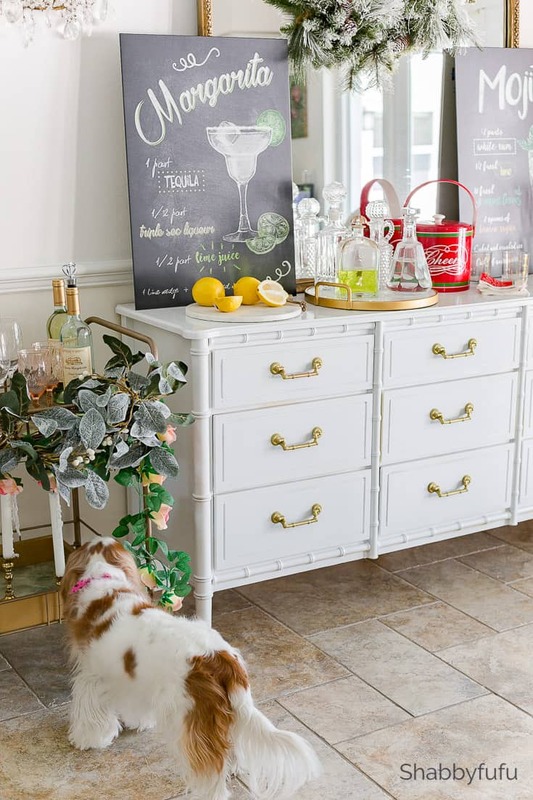 Sometimes I roll this out on the patio to use poolside, and sometimes it makes its way to the living room or family room for snacks! In the living room I moved the sofa table against a wall to set up another area for cocktails. Since our seating here is spread out, why not spread out the drinks and food for convenience! You can see the other two poster Displates that I received and these I hung on the wall over the table. 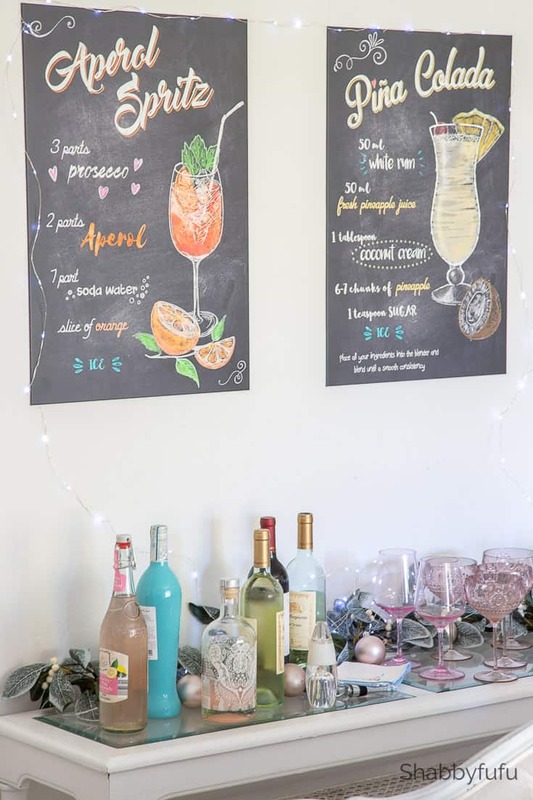 Allow your home to flow from room to room when you have a party and guests will really appreciate not being crowded in small dining spaces. You can really entertain large this way, whatever the size of your home. This post is sponsored by DISPLATE and they are offering my readers FREE SHIPPING. Use the code shabby when you check out. P.S. They are having a Cyber Monday sale and in showing the website to my husband, he fell crazy in love with the Porsche and other car posters! I agree- You have to make the most of the space you have. In one house we turned a front sitting room into a dining room and that worked out great because it was just off the kitchen. We do buffet/open houses, too. Stack tables are great for entertaining in small areas. Some are used as bedside tables when not recruited for entertainment purposes. Dinning and Breakfast chairs can fill empty spaces that you didin’t even know existed. It is the gathering of friends and associates that’s important. Thanks Janet for bringing this subject forward. That’s true….I have some outside stacking tables that do double duty and come inside as well. Great to be flexible with spaces that you have.